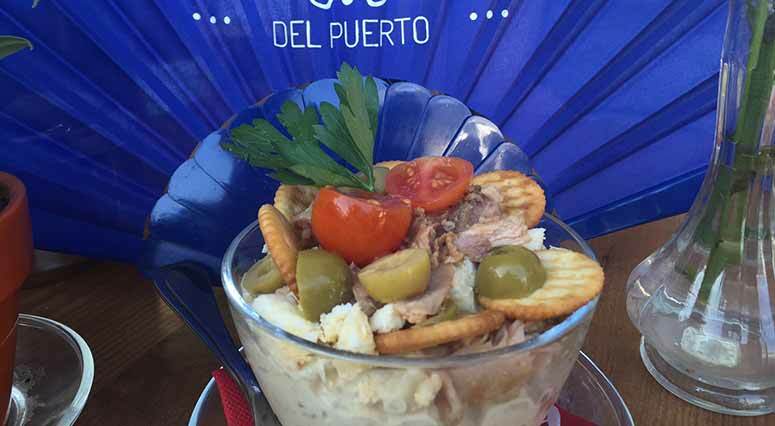 I don’t know about you but we love tapas! 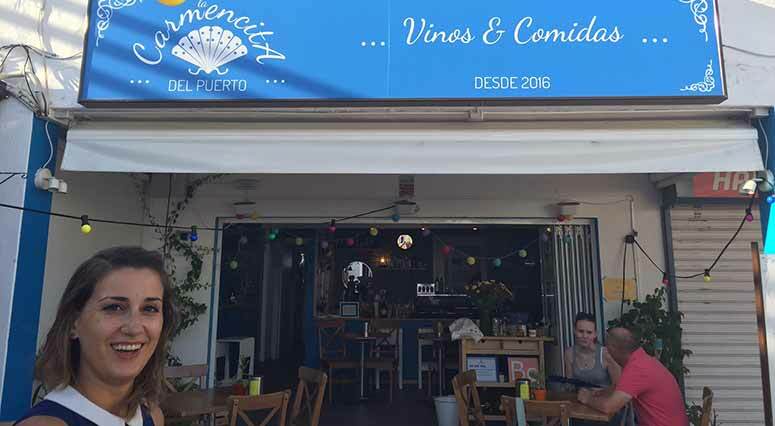 When we started hearing great things about a new tapas bar in Puerto del Carmen we decided to go along and sample the food. 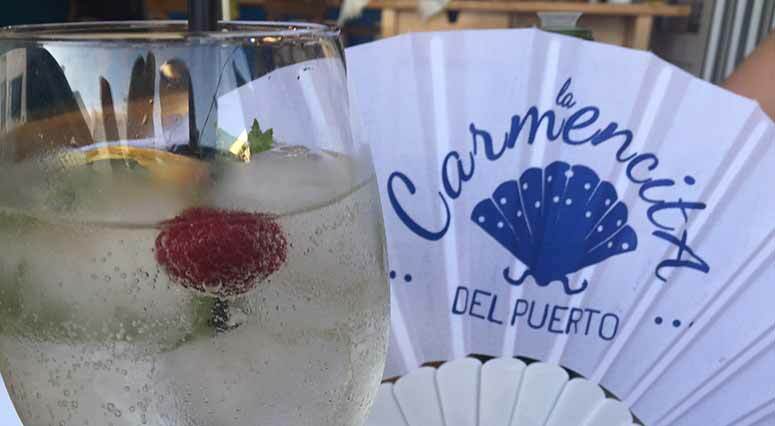 La Carmencita del Puerto tapas bar, Puerto del Carmen, opened its doors 3 months ago and has quickly grown in popularity with locals and visitors alike. Located off the Avenida de Las Playas, this delightful little tapas bar offers a truly authentic tapas experience. Owners Alvaro (chef) and Irena (the perfect hostess! ), both speak fluent English and are enthusiastic about the food they serve and the experience they want their customers to have. 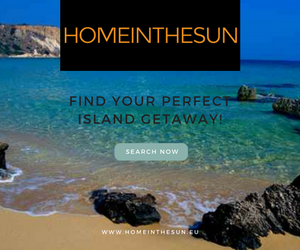 It was refreshing to hear the words “We want to provide visitors to our little bit of paradise with the best possible experience of Spanish food and hospitality”. We arrived early evening, it was still really hot and the first thing Irena did was offer the ladies a Spanish fan each in order to keep cool. She showed us to a table that she recommended as it benefited from a slight breeze. I ordered a glass of red wine, all their wines are served by the glass (whatever the brand or type) and very reasonably priced at 3.50€. As well as offering lager they also offer a darker beer which hubby really enjoyed. Whilst we looked through the menu, Alvaro came to speak to us about the types of food we like and to ask if he could recommend some things. Having eaten tapas many times we were completely up for letting him guide us. To start, Alvaro brought us Salmorejo – a thick, cold soup made from tomatoes, bread, garlic and oil – beautifully served in the traditional style with diced boiled egg and jamon serrano (Spanish cured ham). 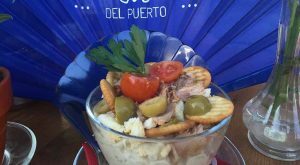 Followed by Endsaladilla Rusa – a popular tapas dish of potato salad with tuna, eggs, vegetables and mayonnaise. Both dishes were really full of flavor and a refreshing start to the experience. After checking that we like fish, Alvaro recommended Mojama – salt cured tuna fillet, which we had never tried. 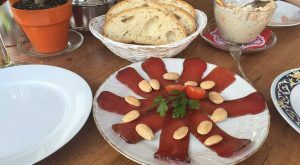 The Mojama came served in thin slices drizzled with really good quality olive oil and almonds with bread on the side. Alvaro explained how Mojama is a particularly popular tapas dish in Madrid. We were not disappointed the Mojama was a hit with all of us! The olive oil they use had a beautiful, nutty flavor and I asked Irena where they buy it from, they import it from Fuerteventura – looks like these guys really spend time finding the right flavors to impress! Ready to order another drink, we called Irena over – hubby ordered the same however Irena recommended I try a refreshing drink called Rebujito – a kind of cocktail made with Sherry (manzanilla or fino) mixed with lemonade and served with lots of ice and fresh mint. Irena serves hers with rasberries (when available) and a slice of lemon too. I’m a complete convert, it is the perfect summer drink, refreshing, full of flavor but not too heavy on the alcohol! The next delight Alvaro recommended was Carrilleras, a meat dish. I asked Alvaro which meat and he asked me to try it before he would tell me assuring me that if we didn’t like it he would bring something else. The dish arrived, simply served with the meat and gravy fanning around most of the plate with pureed potato. Intrigued, we dived in and wow what amazing meat – it simply melted in the mouth and the flavor was stunning. Ever attentive, Alvaro came to ask if we liked it and we all replied at once that it was fabulous and again asked what it was, turns out it was pork cheeks – we would never have ordered this dish in a million years had we known that, but would definitely order it again. 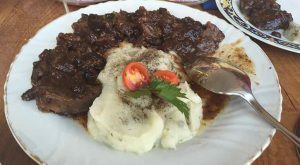 Alvaro explained that the meat was slow cooked with sultanas that had been marinated in port which is why it is so tender and flavorsome. We were getting quite full by this time however Alvaro had a little bit more in store for us. 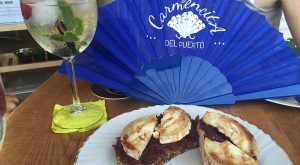 Rather than desert he brought us Montaditos de Queso de Carbra – delightful toasted bread with red wine caramalised onions and grilled goats cheese. A stunning dish that really works, the very sweet onions balanced well with the strong flavor of the goats cheese. 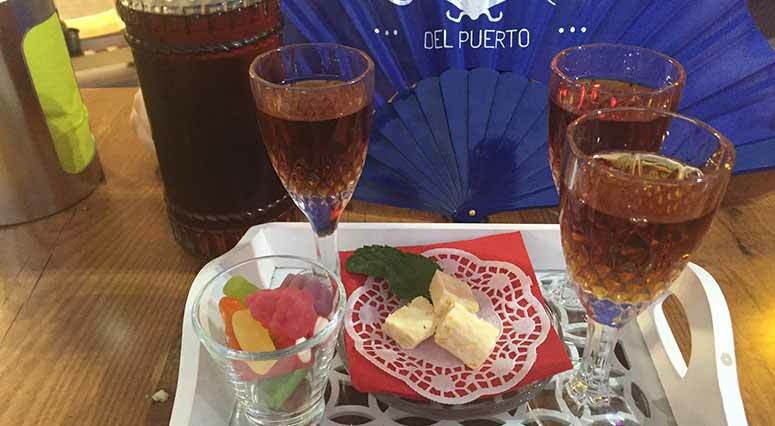 To end the meal, Irena took over and served us a delightful mix of sweeties, chocolate and a chupito (small drink) of Moscatel (sweet desert wine). Throughout the meal we had to opportunity to speak with Alvaro and Irena who feel honored that the local council has invited them to take part in the Feria de la Tapa (Tapas fair) in the old town of Puerto del Carmen 1 & 2 October. 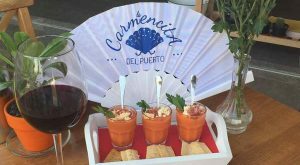 If you’ve never tried tapas and are unsure of the whole experience, this is a great opportunity to pop along and sample some of the delights that La Carmencita del Puerto offer. La Carmencita del Puerto really delivers a truly authentic tapas experience, with great quality food and flavors that when accompanied by great hosts, ensures you leave with a smile on your face and vowing to return.